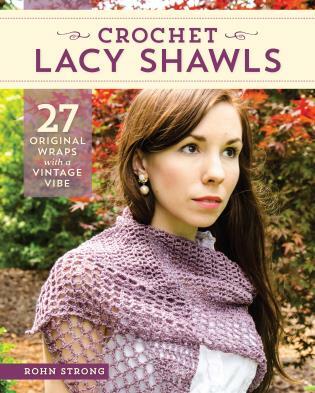 An eye-catching, delicate shawl brightens up any look, and because the pieces are crocheted, they work up quickly, so you’ll be enjoying your new shawls before you know it. A variety of construction methods are explored in the 27 patterns, and each style of shawl includes a beginner, intermediate, and advanced pattern, so you can easily find a pattern that suits your skills and then build upon what you learn. Try a basic pi shawl, triangle shawl, stole, or poncho, then try the same construction with a more advanced stitch pattern in the intermediate or advanced pattern to enhance your skills. You'll have a wide array of gorgeous shawls in no time! Modern patterns with a retro vibe, these pieces are always in style! Crochet designer Rohn Strong is the author of Step Into Crochet: Crocheted Sock Techniques--from Basic to Beyond, New Methods for Crochet Socks, and Heritage Collection: WWI & WWII. He is a regular contributor to the Happily Hooked magazine blog and lives in Raleigh, North Carolina.